Formerly known as the Gold Coast because of the abundance of gold, the name was changed to Ghana after attaining independence from British colonial rule on 6th March 1957. The country is named after one of the ancient Sudanese Empires, which flourished between the 4th and 10th centuries. 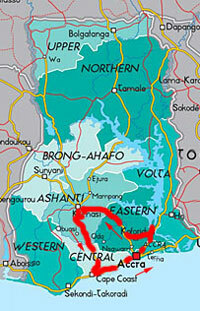 Subsequently, the area was divided among several kingdoms, of which the most important were the Fanti, who occupied the coastal region, and the Ashanti, whose territory was further inland. The Portuguese were the first Europeans to arrive in the late 15th century. 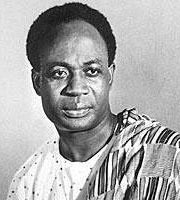 Three years after independence (1960) Ghana became a Republic with Dr Kwame Nkrumah, leader of the Convention People's Party (CPP) as the first President. Under Dr Nkrumah, Ghana made rapid and remarkable progress in education, industrial and infrastructure development and in the provision of social services. 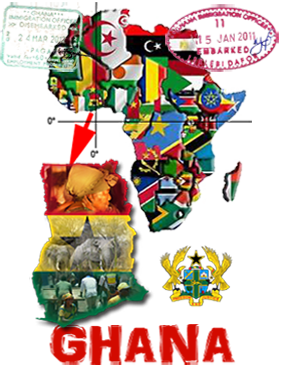 At the same time, the country played a leading role in international affairs - especially the United Nations and Commonwealth - in the struggle for the liberation of other African countries, most of which were still under colonial rule. However, Nkrumah's growing dictatorial tendencies at home disaffected many, especially in the armed forces, and in the end it was they who in February 1966 overthrew the CPP Government in a coup led by Colonel Emmanuel Kotoka. One of the most prominent figures in recent Ghanaian politics is Jerry John Rawlings, a former Air Force Flight Lieutenant, who first came to power as the leader of coups in 1979 and 1981. On the political front, President Rawlings and the ruling party, the National Democratic Congress (NDC) introduced a new constitution in 1992 before submitting themselves to the verdict of the electorate and winning both the presidency and a huge majority of legislature seats. Both Rawlings and the NDC were re-elected in 1996.. 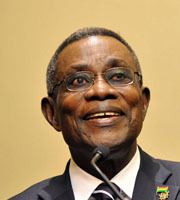 In December 2000, a closely-fought election pitted Rawlings' former deputy John Atta Mills, standing for the NDC, against John Agyekum Kufour, leader of the main opposition New Patriotic Party (NPP) and several minor candidates. 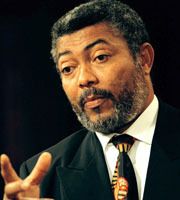 The contest was dubbed 'the battle of the bores', acknowledging the failure of either main candidate to match the charisma of the outgoing Rawlings. However, charisma is not an essential qualification for governing a country and Kufour won the run-off against Mills and took office at the beginning of 2001. The NPP also replaced the NDC as the largest party in the Ghanaian Parliament. 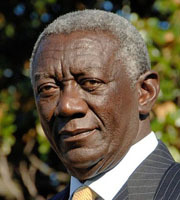 In December 2004, John Kufuor won again the contest against John Atta Mills and he was reelected for another 4-year-term, at the end of which he retired. . In 2008, John Atta Mills, who was a candidate to the Presidential Election for the third time, finally won the contest against the NPP candidate, Nana Akufo-Addo after the run-off with less than 1% difference. 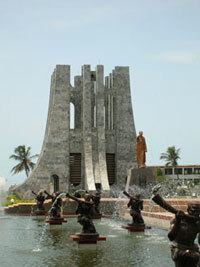 New members of the Parliament were also elected and NDC had the majority. John Atta Mills died suddenly on the 24th of July 2012, just a few months before the next Presidential Election planned in Decembre 2012. 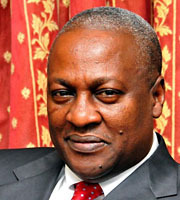 According to Ghana's constitution, the Vice President, John Dramani Mahama was sworn in on the 24th of July 2012. John Dramani Mahama was also the candidate of the NDC for the Presidential Election held in December 2012..
Ghana practice a multiparty parliamentary democracy based on a constitution. The Fourth Republican constitution, accepted by referendum and came into force in 1992, provides for a unitary state governed by a president (and cabinet ministers) and a unicameral National Assembly. The presidency has a four year term and an incumbent can serve a maximum of two years. The Parliament has 230 seats and is elected for a four year term. The Supreme Court headed by the Chief Justice at the apex of the Judiciary constitutes the third arm of Government in Ghana. The legal system is based on common English law, where the courts are bound to develop the notions of fairness to an individual. The constitution also makes provision for continued recognition of traditional Chiefs and customary laws. Copyrights © 2019 Abacar-Tours. All Right Reserved.